Alternatives to Higher Education were explored last week when The Sixth Form College, Solihull held an Employer Networking Event at the Widney Manor Road campus. Supported by Solihull Chamber of Commerce and LADDER for Greater Birmingham, the event was aimed at students who are considering employment, apprenticeships or training opportunities other than universities. 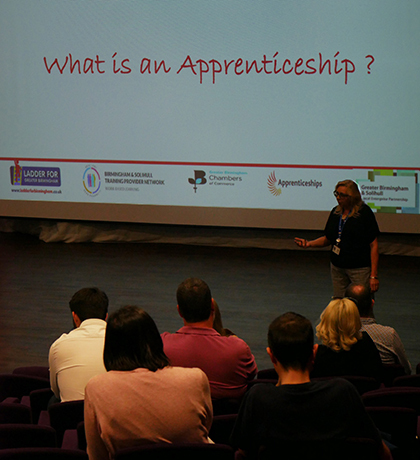 Parents were also in attendance and they received a talk on apprenticeships by Anne Moore from LADDER. While parents enjoyed their presentation, students took part in “World Cafe” style roundtable discussions with employers. Those present to offer their expertise included ADI Limited, Cogent, IBM, Marel, Resort World led by Genting and the Royal Institute for Chartered Surveyors. “We are so grateful to Solihull Chamber of Commerce and LADDER for Greater Birmingham, as well as all the employers for giving up their time to participate in this event. It was well attended by students and they said they found it a useful exercise. It has given them lots of food for thought as to their options when they finish their studies with us. In 2018, 70% of students progressed from the College to university, but more than 9% chose Higher Apprenticeships as their preferred route.